I didn’t have a pair of red shoes! The award post. But now I have a pair of virtual red shoes, actually only one red shoe. I am waiting for the other shoe to drop… something like that. What does that Mean! Where did that expression come from? Don’t you ever wonder about some of these sayings? What other shoe? And where is it dropping from? 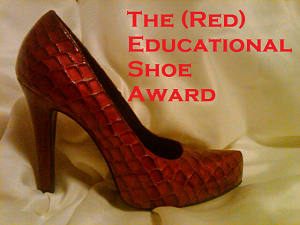 However, I was awarded the Red Educational Shoe Award by Katherine Ingrid whose poetical charm has been gently seeping into our subconscious as she very quietly takes over the world with words and art. Thank you so much Kathryn. This is an exciting one to pass on, though as usual it took some thinking about. You see there is an element of teaching and learning in each of my carefully collected blog buddies who have carefully collected me in return. The Kitchens Garden comments section is where an enormous amount of information lands and I am endlessly impressed by how much I can learn from your comments. And wonderfully, a person’s comment is my introduction to their blog. So first I need to thank you all for taking the bull by the horns and just putting in your tuppeny’s worth. And this is where I began my search for just a few of the many deserving pages. Maggie from Mehaffey Farm who is a stand out gardener who feeds many families from her farm, and always adds information to her comments. I have learnt piles since she found me. Linda. from Savoring Every Bite. I have been looking for an award that would suit our Linda and I know this is the one. Personally I think she would look great in red shoes. Also she is a Midwest girl (now in Florida) and cooks with an Italian flair that teaches me non- stop! I listen to her and just know that she really does savor every bite she takes! A lovely generous supportive personality. Rumpy Dog speaks out about animals from all walks of life but mostly about dogs and cats who have been abandoned and found. There are many happy endings on these pages and much to learn. All dogs like red shoes! Audrey from Minnesota Prairie Roots passionately loves the little towns that surround her and takes her camera along. She is a writer. She is always informative and kind. She is another one who is unstintingly generous with her helpful comments. Sharyn from Kale Chronicles is on a mission to cook and eat seasonally and has a very special ability to illustrate her work. Pop over and you will see what I mean. Also she is kind enough to pop in with info and help when she thinks I need it which is often. She is new to the farmy pages and a wonderful find. Charlie from Hotly Spiced. When I read her About page I laughed out loud. You will see why if you have time to pop in. She has taught me that writing a blog IS Writing! So hang this cool award on your walls and pass it along whenever you feel like it. While we are on the subject of awards- Two Big Hearty Thank You’s. I need to thank the lovely Gretchen for tagging me to answer a few questions that I answered in this post. She blogs in between writing (which means she writes in between writings!?) and also lives out on the land. Or I guess it would be better to say the land lives around her. And also I thank Natalie from What we Ate Today for mentioning me again in conjunction with the Versatility Award. I have received this a few times already so I am beginning to feel very versatile indeed. Thank you so much Natalie. Pop over and visit as she has some stunning food over there! I put a bed of rocks in an enamel basin for drainage, filled the basin with potting mix and sowed thick lettuce seed. This is sitting in a bright South window in a cool room, and I pop it outside anytime we get above 38F. I water it with a mister so the tiny plants do not get knocked down by heavy watering. You can eat them at the microgreen stage but I like to let them go a little further and get a bigger mouthful. So in a few weeks I will get a pair of little scissors and I shall cut a salad of baby lettuce leaves! If I am careful to only give the wee plants mini haircuts then the plant will keep growing greens for me. It may be a small salad but it will be delightfully tasty and it gives me something green to take care of until I can start seriously sowing seed. Until then I am forcing myself to sit on my hands. Of course John is already way ahead of me. He very carefully cleans and stores his little pots every year and has them filled with tomatoes and cabbage already, but soon he will run out of his orange pots and he will be begging me for paper ones! It looks like it will be a warmer day today with a high of 47F forecast, so the plants will get to go outside this afternoon. The sun is coming up and will peek out before disappearing behind a heavy cover of clouds. So I had better scuttle back down my ladder and rug up and get out into the barn. TonTon and I have another flock of chickens and cats to look after for a while as my neighbour has been called away, so it is busy busy (my favourite!). If the light is good I shall collect some farmy shots for you today. I look forward to that. ← With no respect for cold. Oh Dog! Thank you so much for thinking of me! And I DO love red shoes…. preferably made of leather. Have you never slept in a room in a flimsy building below another bedroom? The chap up there takes off his first shoe – clunk on the floor. You cannot sleep until the second one drops, and you’ll wait a long time if he only has one foot! I like the idea of eating infant lettuces. Do you do bean sprouts? I love them and they are so easy to grow, in a lidded jamjar of water which you shake from time to time until the beans start to sprout. You can do it with all kinds of pulses. I’m about to make your lemon curd cake for my sewing ladies coming tomorrow. I hadn’t either – and I’m British…. Goodness me, you still have time to look after the neighbours farmy – you are beyond remarkable dear Celi! Congratulations on your awesome awards! No guessing that I love your pics of your seedlings. I am learning more and more about my camera and having loads of fun taking pics and deleting and taking more. Congratulations on another award! 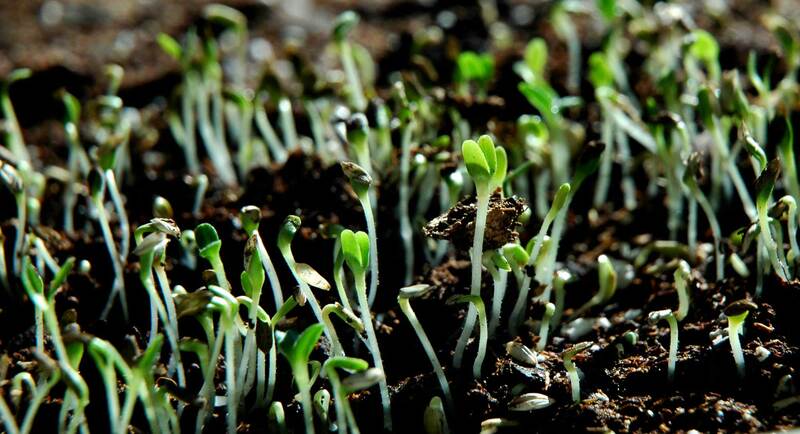 Lovely pictures of the seedlings. I cannot wait to get mine started. I am honored to be a recipient of your Red Shoe Award, C. So honored. Thank you for starting off my day in such a fine way. Truly. I am humbled. And you, my dear, are most deserving of this award for all you bring to us, your readers. Your ability to create a strong sense of place through your words and images is truly a gift. Thank you. You’re so kind to mention me. Thank you! The Red Shoe award is perfect for you. You are a teacher at heart – one whose students are always glad to read what you have to say!! Have a lovely day in your spring-like temperatures! I’m trying to picture you hopping around in one red shoe and one work-a-day boot:) and I have no idea about things dropping, I’m hopeless with expressions and proverbs. But I do envy you your salads. I’m off home in a week and I know that after making a cup of tea and lighting the fire the first thing I will do is to get my seed stash out and start a few tentative sowings. Congrations C, it’s a lovely award for a lovely person. Congratulations on your most deserved award, Cecilia! i constantly learn fun and interesting, as well as useful, things from your posts. I think there also needs to be some sort of “Entertaining” award as you’d top the list for that one, too! 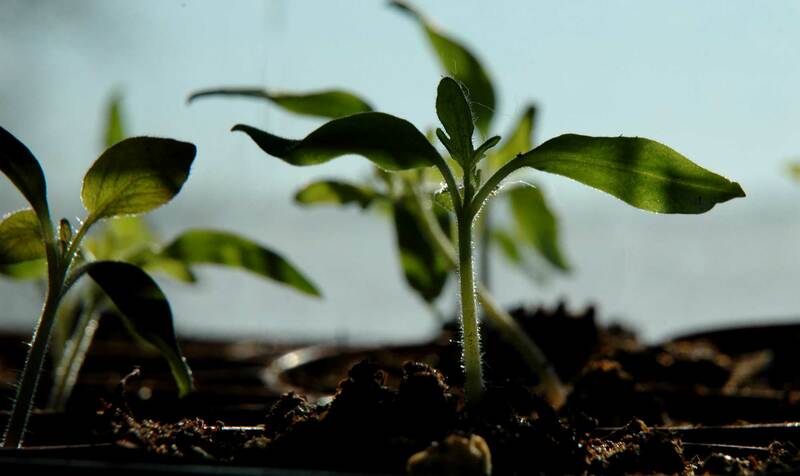 Your seedling pics remind me that I need to finish up those paper pots and get cracking this week. Good morning! Congratulations. You are absolutely deserving…I have learned so much from your blog and you. Thankfully here in South Africa our winters are short I am making the most of our lettuce and salad produce from our little vegetable garden. Well done on the award. Hearty, heartfelt congratulations, my dear! You are indeed a teacher at heart! John’s tomatoes are making me long for spring! Congratulations on receiving the red shoe award. You have plenty to teach us since you grow your own food and preserve it, such as your system for raising window lettuce in a basin — not to mention giving us photography tips and poetry lessons. And thanks very much for passing on the award to me: I do have a teaching bone in my body when it comes to showing people that they can eat seasonally and I love to encourage others to use their creativity. Thanks for your kind words. Well, thank you Cecilia! A girl can never have enough shoes….let alone RED!! Congrats to you as you truly educate and share your knowledge of life and farm in each and every post. I admire you and your lifestyle; your posts have made me become more careful about using the resources I have around me and less super store shopping!! I’m glad I could share just a wee bit of something that had you think of me. Thank you so much!! I bought a sprouting tray last year and have had a wonderful time growing and eating all types of sprouts. I never thought about doing baby lettuce. Think I’ll give it a shot. The forecast for my little area of Central West Illinois is calling for highs of 64 today and tomorrow. Talk about a case of spring fever. . .I was very tempted to call off sick from work (cough, cough) and go out and play in the dirt. :-). Oh, waiting for the other shoe to drop is usually used after an omen, or, when you are awaiting something bad to happen. Sort of like…on pins and needles…anxiety, or anyway…where on earth would you wear a pair of those anyway? Okay, that’s none of my business. thanks for all the links! i can’t wait to check them all out! No surprise that you would accept a teaching award with a highly educational post!! Further proves my point, if it needed any shoring up, doesn’t it! Clever, wise and ever the gentle teacher, our Celi. Hurray! Congratulations. I have heard the expression ‘waiting for the other shoe to drop’ but like you I have never been sure of what it means, so I am now off to check it out on the net. Congratulations, Celi. I adore your style and approach to educating us about all aspects of rural living…including hunters. Without even trying, you make living off the land the greatest adventure in the world – just by being you. I am continuously amazed at your versatility which is exactly what farm life needs. But to have all your skills, experience and intelligence in one package…well – that John is a lucky man! Speaking of education, Celi, what is “rug up”? Is that putting your bed to bed or rolling yourself up in warm clothes? Congrats on the award Celi! And may warm weather be just around the corner for you and John! I do hope warm weather is around the corner, tho we still have Feb to deal with, and february can be bad! I have a mental image of you clicking your ruby-slipper-heels together! I laughed when I read the first paragraph of this post too, so true, all the English sayings that make no sense at all 😉 Good morning! Great pics. I also find etymology and idioms fascinating–if not hilarious. I don’t have red shoes either! Great picks and pix. Congrats, Celi, for your lates, well-deserved awards! You certainly have taught this city boy a thing or two and I look forward to each and every day’s lesson. Good afternoon! You are stepping out in style! Congrats! Well deserved. I can almost hear those little plants growing! Mustard and cress are great too, to snip off with the scissors and sprinkle over other food. Well done, Celi. One of the things I enjoy about you getting so many awards is that I am lead to new blogs. So, thanks for ‘winning’. Congrats on the award, you deserve i. Viv’s explanation ref the shoe dropping makes perfect sense. I like both Viv’s and Paul’s explanation of the “other” shoe dropping. I’ve always heard it as an omen type thing. Even if it was something good that happened “first shoe” you better wait for the “other shoe” to drop it could be something bad. Or if it was something bad first it could be even worse the next. So you don’t “fly off the handle” to fast, wait for the other shoe to drop.